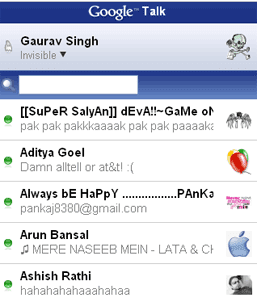 Google has just launched its popular Instant Messenger Google Talk aka Gtalk for iPhone. There hasn't been a headway in the PC client for more than a year now but surely recent updates have shown that the work is still ON and the client is not dead. With Apple about to release iPhone 3G very soon in many nations, this is a good offering. In order to use Google Talk on your iPhone all you have to do is go to www.google.com/talk on your iPhone and sign in there and start chatting. It is built in within the browser ans so you need not download any tool for Google talk. Another Option is to goto Google Talk Mobile and enter your mobile number there and the link would be sent to your phone directly. If you are using Google Apps then you can visit: http://talkgadget.google.com/a/your-domain.com/talkgadget/m , to get started. Replace your-domain.com with actual domain name.